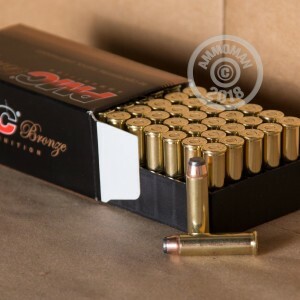 This case of 1,000 rounds in .357 Magnum is a great deal for your revolver shooting needs. The 158 grain jacketed soft point is a flat-shooting, accurate load. 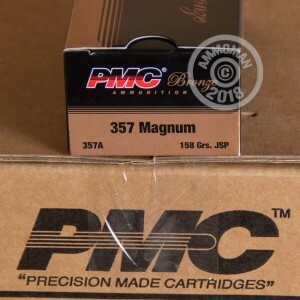 This ammo is made in South Korea by a top defense contractor and uses electronic quality control systems, non-corrosive Boxer primers, and reloadable brass cases. 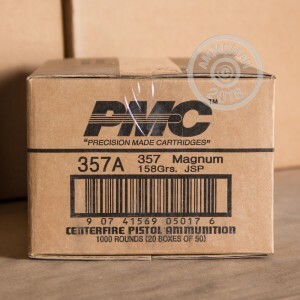 Each case contains 20 boxes with 50 rounds each. Buy at least $99 from AmmoMan.com and get shipping on the house. Free shipping means absolutely no S&H charges--you pay just the list price, nothing more. Always got good performance out of anything from PMC. I highly recommend it. I use this exclusivity in my Coonan B.